From left: Achal Pratap Singh Grewal, Anmol Jain & Nishant Sindhu. 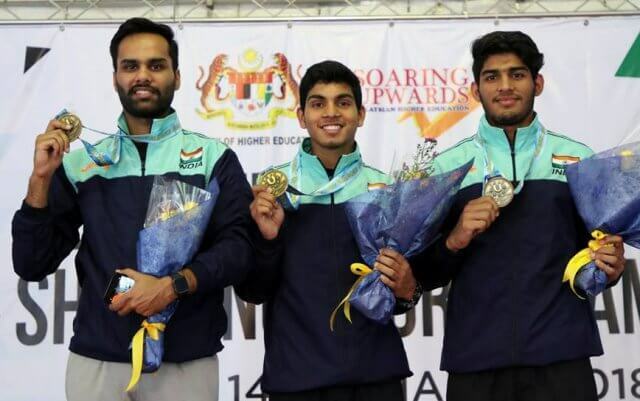 India won the team gold medal in Men’s 10m Air Pistol at the 7th World University Shooting Championship in Kuala Lumpur, Malaysia. The team of Anmol Jain, Achal Pratap Singh Grewal and Nishant Sindhu shot a score of 1725 to win the gold. Russia won the silver with 1716 while Korea took the bronze with 1709. In the individual category, Anmol finished 6th with 156.6 in the finals. The 2016 National Champion from Haryana qualified for the finals with the second best qualification score of 578. 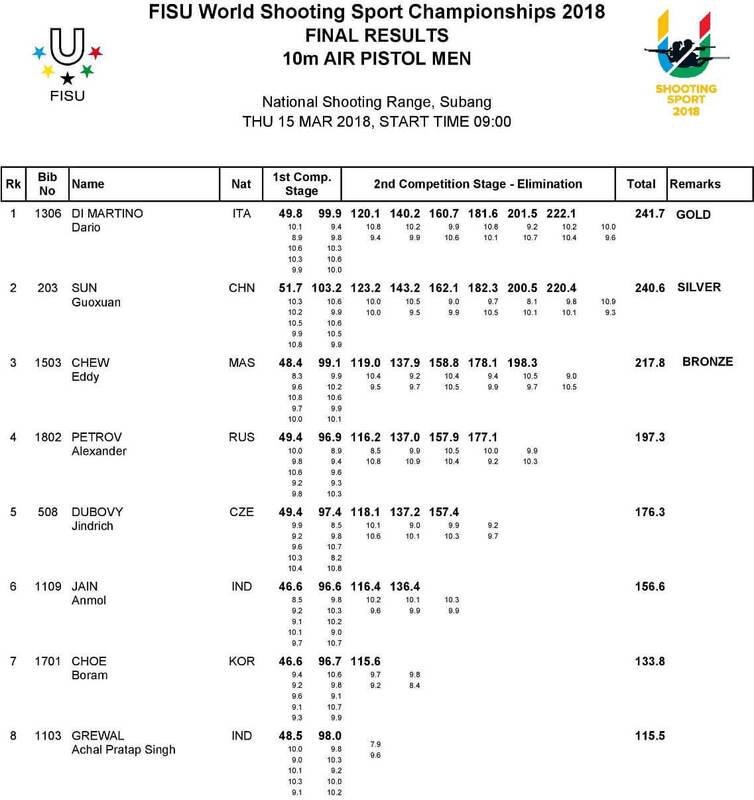 Achal also qualified for the finals with 576 but was the first to be eliminated after shooting 115.5 in the finals. Nishant Sindhu shot 571 to finish 13th. Italy’s Dario Di Martino won the gold with a score of 241.7. The silver was won by China’s Sun Guoxuan with 240.6 while Eddy Chew of Malaysia took the bronze with 217.8. Men’s 10m Air Pistol: 1. Dario Di Martino (Italy) 241,7 (584); 2. Sun Guoxuan (China) 240.6 (574); 3.Eddy Chew (Malaysia) 217.8 (574); 6. Anmol Jain (India) 156.6 (578); 8. Achal Pratap Singh Grewal (India) 115.5 (576); 13. Nishant Sindhu (India) 571. Men’s 10m Air Pistol Team: 1. India (1725); Russia (1716); 3. Korea (1709).